The American Boer Goat Association honored 16 people with Ambassador to the Bred Award at the Annual Members Banquet that took place during the 20th Anniversary ABGA National Show. The Ambassador to the Breed Award was initiated by the ABGA Board of Directors in 2012 to honor people who the association believes have made an impact on the goat industry. In addition to receiving an ABGA bronze, the recipients’ names are placed on a plaque that resides in the ABGA office. They are also listed on the Ambassadors to the Breed page on the ABGA website. The first awards were given in 2013 and went to Dr. Frank Pinkerton, Marvin Shurley, the Kearney Family, and Dr. Frank Craddock. 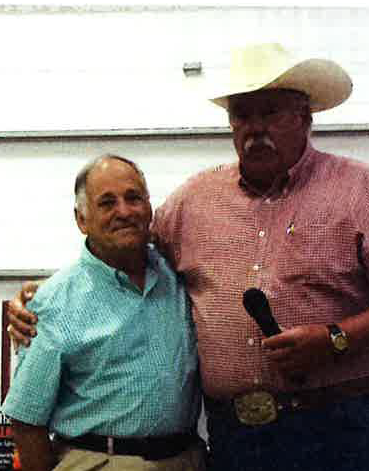 Buck Pruitt and Dr. Lou Nuti both attended this year’s banquet and received their awards in person. The 16 individuals who received 2014 awards are those who first realized the full impact the South African Boer goat could have on the U.S. goat industry. They had the foresight and vision to enable them to put their personal differences aside and begin the work that would lead to the formation of the American Boer Goat Association. This entry was posted on Thursday, August 14th, 2014 at 6:58 pm and is filed under Animal Systems Research, College of Agriculture and Human Sciences, International Goat Research Center. You can follow any responses to this entry through the RSS 2.0 feed. You can leave a response, or trackback from your own site.